Deep convection has been sustained for over 24 hours and is now starting to organize into a central mass. An earlier Quickscat satellite pass did not reveal a closed circualtion at the surface, but a trough. We think that we are now very close to the low having formed. Other then one band near Puerto Vallarta, the heavy rain and winds are well offshore. As of 9:00 am edt / 6:00 am pdt the tropical disturbance was centered near 15.0° N / 107.0° W or about 325 miles southwest of Manzanillo, Mexico. Top sustained winds are estimated at 35 mph. The tropical disturbance is moving northwest about 5 mph. Forecasts take this system generally northwest toward Cabo San Lucas over the next few days. 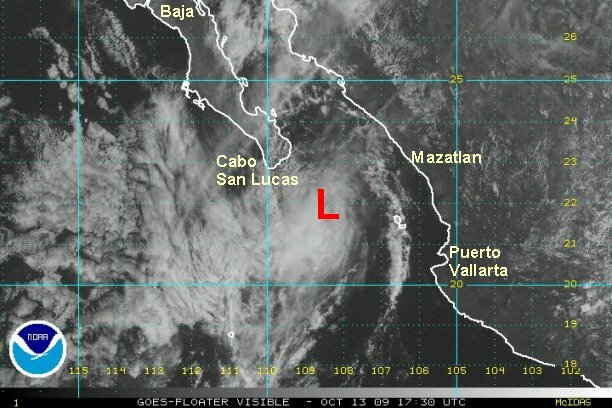 Interests in the Los Cabos area should keep an eye on this system. At this point we have an unofficial tropical depression. The Quickscat satellite show a nice closed off surface low with 30-35 knots winds on the southside of the low. In fact the low is close to becoming tropical storm Patricia. Deep convection has bursted near the center of the low. The hurricane center is probably trying to wait this one out, hoping that it dies. The tropical forecast models don't do too much with it. "It is what it is". As of 8:00 am edt / 5:00 am pdt the tropical disturbance was centered roughly near 16.0° N / 110.0° W or about 470 miles south of Cabo San Lucas, Mexico. Top sustained winds are estimated at 35 mph. The "tropical disturbance" is moving west northwest about 5 mph. NHC will likely classify this system at 8 am pdt. Forecasts take this system generally northwest toward Cabo San Lucas over the next few days and weakens the system. Our tropical depression has been officially classified, even as deep convection doesn't look as impressive as earlier today. The low level circulation is clearly seen of the northwest edge of the convection. The tropical depression may never make tropical storm strength if the wind shear doesn't relax. Either way, there is not much of a difference between a weak tropical storm and tropical depression. As of 5:00 pm edt / 2:00 pm pdt tropical depression 19-e was centered roughly near 17.3° N / 108.4° W or about 400 miles south southeast of Cabo San Lucas, Mexico. Top sustained winds are estimated at 35 mph (NHC 35 mph). The tropical depression is moving north northwest about 6 mph. Forecasts take this system generally north northwest toward Cabo San Lucas over the next few days and weakens the system. Indeed, wind shear did relax enough allowing for a burst of deep convection near the core of the circulation. Winds have picked up some to just above minimal tropical storm strength. Only weak banding is noted at this time. As of 6:00 am edt / 3:00 am pdt tropical strom Patricia was centered roughly near 18.7° N / 108.9° W or about 300 miles south southeast of Cabo San Lucas, Mexico. Top sustained winds are estimated at 45 mph (NHC 45 mph). Tropical storm Patricia is moving north northwest at about 7 mph. Forecasts take this system generally north northwest toward Cabo San Lucas over the next few days and weaken the system. The greatest threat would be heavy rain to the southern Baja assuming that convection continues to hold on. Tropical storm Patricia continues to strengthen today. Well, it looks like everyone is a little befuddled by the persererance of Patricia. It has continued to strengthen today with a well formed CDO or central dense overcast. Wind shear has continued to stay weak, allowing for the strengthening. Rainfall of a few inches on the southern Baja is possible as Patricia moves toward the area over the next 24 hours. Winds may pick up to minimal tropical storm strength, with the most damaging conditions remaining offshore. 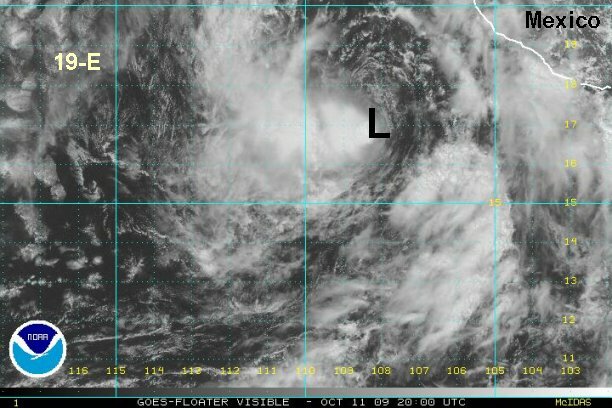 As mentioned by NHC, even with microwave and visible satellite imagery the exact center remains tough to pinpoint. We agree and find no good reason to deviate from the earlier position. The exact center is still somewhere near there. As of 7:00 pm edt / 4:00 pm pdt tropical strom Patricia was centered near 19.8° N / 110.1° W or about 215 miles south of Cabo San Lucas, Mexico. Top sustained winds are estimated at 65 mph (NHC 65 mph). Tropical storm Patricia is moving northwest at about 8 mph. Interests in the southern Baja need to follow the progress of Patricia and take any necessary precautions. Tropical storm Patricia continues to move around a mid level ridge keeping it moving north or just a little east of due north. NHC's official forecats calls for a northwest turn shortly as the ridge builds back to the west. At this time there is no sign of that happening, which will put the center closer to southern Baja. Recent satellitie imagery shows a marked decrease in convection as the cloud tops warm. With this being the case and with the last Quickscat only findling one 50 knot wind, we are estimating top sustained winds only at 50 mph. It also looks like windshear is picking up again as the system is becoming elongated. Rainfall of one inch or more is possible in the south Baja. Winds may not be an issue if the current trends of cloud top warming continues. 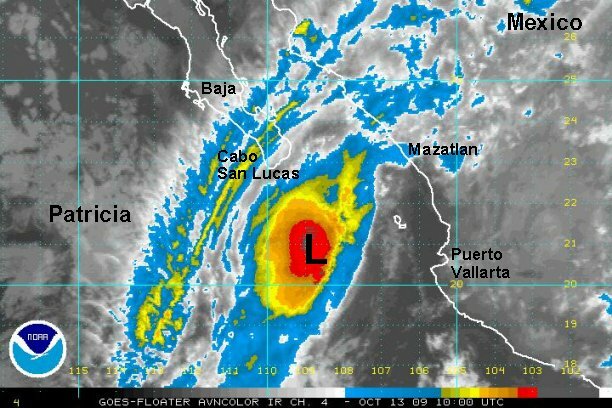 As of 6:00 am edt / 3:00 am pdt tropical storm Patricia was centered near 20.7° N / 109.3° W or about 215 miles south souutheast of Cabo San Lucas, Mexico. Top sustained winds are estimated at 50 mph (NHC 60 mph). Tropical storm Patricia is moving just east of due north at about 6 mph. Satellite imagery continues to show cloud top warming, indicating significant weakening. We now estimate Patricia to be significantly weaker than the Hurricane Center's estimate of 60 mph. The turn to the west still has not occured either. At this point the potential effects to the Baja are decreasing. Chances are that tropical storm force winds will not be seen unless Patricia makes a significant comeback. Rainfall amounts will now also be be lower and in many cases be less than an inch unless Patricia strengthens again. As of 3:00 pm edt / 12:00 pm pdt tropical storm Patricia was centered near 22.0° N / 108.6° W or about 95 miles southeast of Cabo San Lucas, Mexico. Top sustained winds are estimated at 40 mph (NHC 60 mph). Tropical storm Patricia is moving just east of due north at about 7 mph. The National Hurricane Center is now more closely agreeing with us as they have taken the winds down to 40 mph from 60 mph on their last advisory. The latest satellite imagery shows that no deep convection remains near the circulation center. We now estimate top sustained winds at 30 mph and Patricia no longer a tropical storm. Only minimal amounts of rain are expected for the southern Baja. Patricia is now moving northwest and is just south of Cabo San Lucas.